Steven E. Koonin is the founding director of the Center for Urban Science and Progress at New York University. 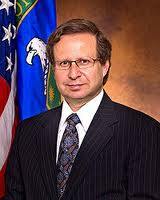 Until November, 2011, he was the Under Secretary of Energy for Science at the United States Department of Energy. He was previously Chief Scientist for British Petroleum, where he was responsible for guiding the company's long–range technology strategy, particularly in alternative and renewable energy sources. Koonin joined BP in 2004 following a 29–year career at the California Institute of Technology as a Professor of Theoretical Physics, including a nine–year term as the Institute's provost. He has served on numerous advisory bodies for the National Science Foundation, the Department of Defense, and the Department of Energy and its various national laboratories. Koonin's research interests have included theoretical and computational physics, as well as global environmental science. Koonin received his Bachelor of Science from Caltech and his Ph.D. from the Massachusetts Institute of Technology.